I am not in a hurry for Fall. We have has some crazy weather so I thought I would make a tart. I had some apples on hand, so it seemed logical to put them to good use. 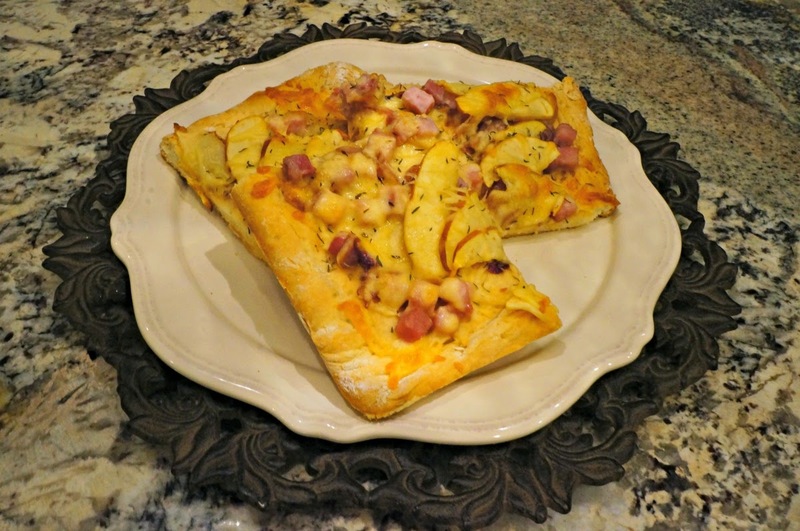 I made a savory sweet topping of apples, carmelized onions, ham and cheese on pizza dough. 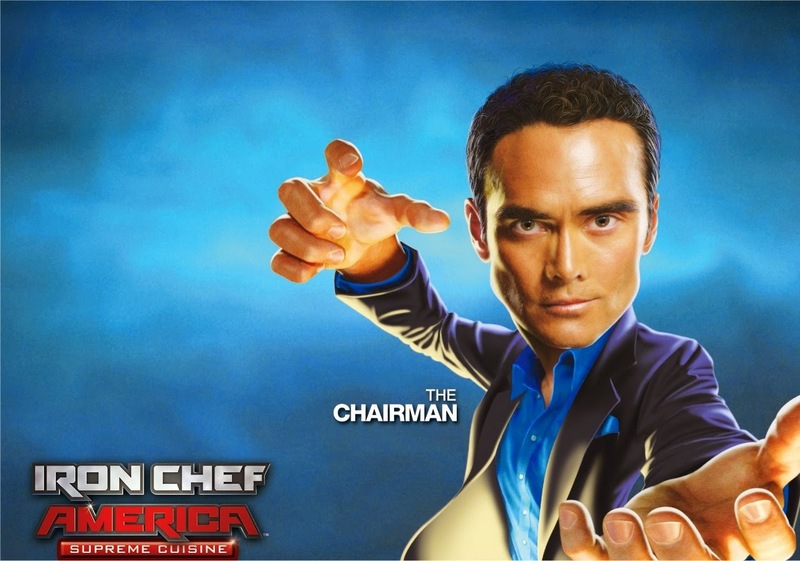 Everytime, I say pizza dough, it reminds me of the episode of Iron Chef America, where the mystery ingredient was pizza dough. The chairman is always so dramatic with his presentationn of the mystery ingredient. It is so funny to hear him say allez cuisine"pizza dough" with drama and flair. 1. Place oven rack in lowers position and heat oven to 450. 2. Melt butter in skillet and add sliced onions. Cook covered on medium low for about 12 minutes. Stir. Uncover and cook an additional 2 minutes. Bake until puffed and lightly crisped. Removed from oven. 4. 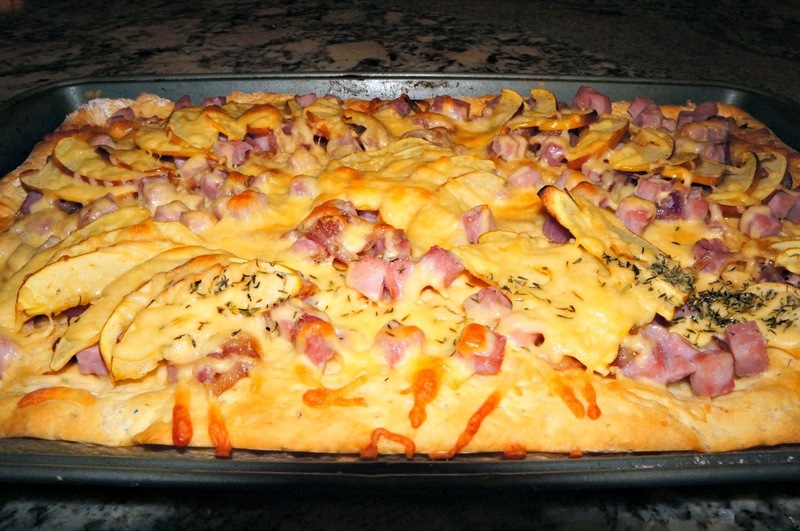 Top crust with ham, then layer with carmelized onions, apple slices and cheese. Bake another 10 minutes until crust is brown and crispy. 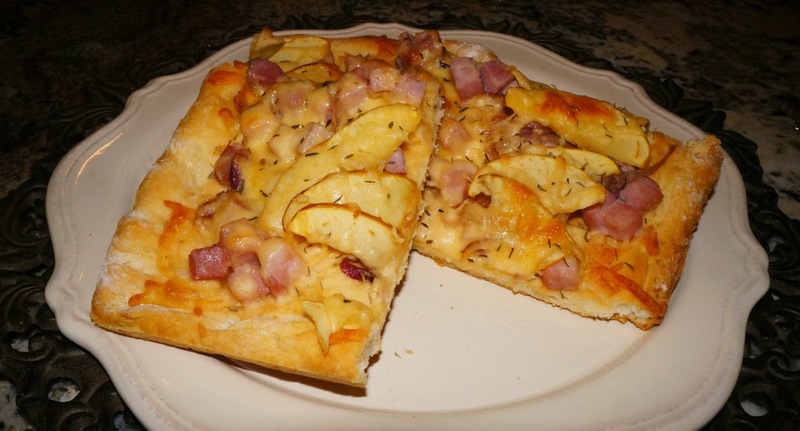 Good Morning Linda, What a lovely combination, caramelized onion with apples and I love the idea of using pizza dough.... I can see a little cookathon happening on Saturday as George would love to eat this tart whilst watching Saturday evening television. That looks so good! I hear we're having a bumper crop of apples this year! We're going to warm up and it will be quite warm (for us) in the coming days. Yep summer is still here and I'm not rushing into fall just yet! How good your tart looks, Linda! I would love to have a big serving of that yummy deliciousness overlooking your beautiful yard. This looks delish!!! I love the sweetness of the apples added! I want to DECORATE for Fall but don't want the COLD:(:( I just read that the Farmers almanac says we are going to have a COLD and snowy winter!!! NOOOOO!!!! Oh, this would be great for a weekend breakfast! I love doing different pizzas. Oh, that looks so good, Linda! And to think I just ate a boring salad last night after we hung up, lol. I wish I had been at your house for dinner! I love these ingredients together and I bet the thyme pushed it over the top. Gorgeous! It looks too delicious! I am so trying this over ther weekend! Hi Linda, This looks so good. I can sub the pizza crust for my gluten free version. Thanks for sharing. I love anything with apples. This sounds great! I make homemade pizza every Friday! This one is on my list! Thanks for sharing. It's good to get around and see what every one is up too! Hi Linda, this looks so good. I love caramelized onions. I hope you have a wonderful weekend. Thanks for sharing! Hugs and blessings! HI Linda, love this combination, caramelized onions and apples sounds like a match made in heaven. Now this is a great way to enter a new BACK TO SCHOOL week for me! Though it's hot and humid here, school is back in session and before I know it, fall will be upon us and this is the perfect recipe. I will be posting my writer's tour in a few days, but I need to get back to school tomorrow and get my momentum back in order to manage blogging and work. Thank you for nominating me, and I had fun composing the post. 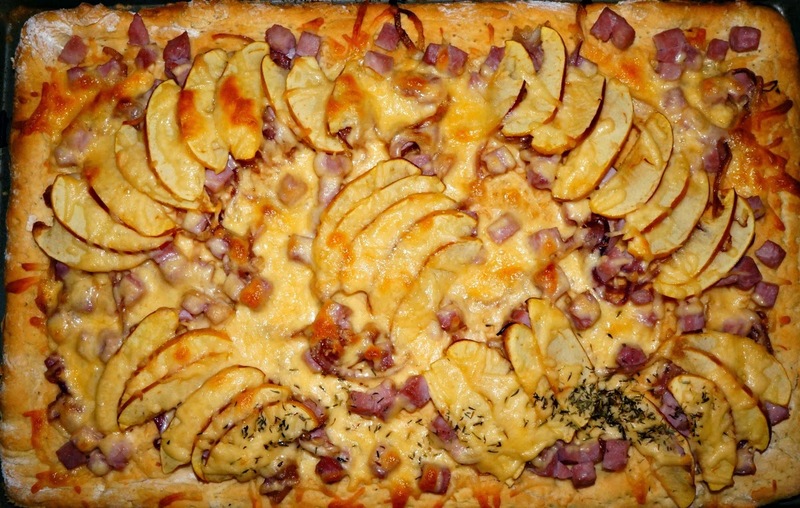 What a great idea for your delicious Carmelized Onion and Apple Tart. Thank you so much for sharing with Full Plate Thursday and hope you have a fabulous week! have never heard of this combination before, but it does look yummy. That dish looks amazing... it must have been soooo delicious! A great combo.